JFK minutes before the Martians killed him. The assassination of John F. Kennedy is one of the most popular sources for conspiracy theories. The people who subscribe to these theories often focus on the idea that Lee Harvey Oswald did not act alone, that he was a "patsy," or that Oswald didn't commit the murder at all. They also often argue that shots were fired from the "grassy knoll" near Dealey Plaza in Dallas, and not only from the Texas School Book Depository from where Oswald shot Kennedy. Some conspiracy theorists also believe that the Warren Commission report was a coverup. Oswald made the shot; however he had some group providing logistics. The mafia was behind it, as payback for JFK sleeping with their mistresses and his brother, Robert F. Kennedy, cracking down on organized crime after they allegedly helped them win Illinois in the 1960 election. Alternatively, they did it because JFK went too easy on Fidel Castro, which cost the mob revenues from Cuban casinos. Right-wing anti-Castro groups were behind it, as payback for the botched 1961 Bay of Pigs invasion. Fidel Castro himself was behind it, in retaliation for the Bay of Pigs invasion or numerous assassination attempts from the CIA. The CIA, or a rogue faction of CIA agents and private wingnut activists was behind it. The government of Israel and Mossad were behind it, because Kennedy opposed Israel's nuclear weapon development programs. The Democrats assassinated Kennedy because he was a Conservative. People like Mary Lou Bruner believe this. Woody Harrelson's estranged father, Charles Harrelson, was behind it. Kennedy was assassinated because he had attempted to restore the printing of paper money by the U.S. Treasury rather than the Federal Reserve bank (a favorite theory of Paulbots). Kennedy was assassinated by a cabal who wanted to expand the Vietnam War, because he was about to pull U.S. troops out. Some focus more on the theory that there was a second gunman at the grassy knoll and, again, Oswald being a "patsy" rather than trying to ascribe any broader conspiratorial motive. T. Casey Brennan did it, or so he says. This claim is just one ingredient of his mighty chick-magnetism. Principia Discordia author Kerry Thornley was Lee Harvey Oswald's best friend in the Marines in 1959, so there is a Discordianism connection to the assassination. Oswald shot Kennedy through the neck and a Secret Service agent in the following car accidentally shot him in the head raising his rifle to return fire (the third casing by Oswald was used to keep the chamber of his rifle clean). Oswald was a patsy and Joseph Milteer, a right-winger associated with extremist groups such as the Ku Klux Klan and who was under surveillance for threatening to kill the president, had arranged or participated in the assassination. Some believe Milteer was part of a conspiracy masterminded by the Papacy which involved the U.S. Intelligence communities and remnants of the Third Reich brought over during Operation Paperclip. Kennedy arranged it all as an elaborate suicide. Kennedy survived and was replaced by a double "they" buried instead, alien abducted, still secretly running things from behind the scenes along with his family, the "curse" being a huge smokescreen, died in a mental institution as a vegetable from the brain damage... take your pick. Kennedy was shot in the head in Dallas but survived thanks to the government putting a metal plate in his head, they then dyed his skin brown and put him in a nursing home to live out the rest of his days as the senile old man no one believes. After this he meets Elvis Presley (who everyone thinks is actually just an Elvis impersonator, mainly because this Elvis was bored of being Elvis so he went and swapped places with an Elvis impersonator)and they go on a quest to kill a resurrected mummy who is sometimes referred to as Bubba ho-tep. Conspiracy theories about the assassination are still popular on both the left, right, and amongst the American public. The first official investigation was undertaken by the Warren Commission, which concluded that the assassination was not a conspiracy, and all official investigations after it have more or less accepted its findings. The United States House Select Committee on Assassination, however, concluded that there is a high probability that the assassination was a conspiracy. Two conflicting reports, and that's where it all began. Two early books critiquing the Warren Commission report were Inquest by Edward Jay Epstein, and Rush to Judgment by Mark Lane. Both hinted at a conspiracy and were relatively tame by today's standards. Mark Lane later went off the deep end with conspiracy books on several other subjects (including the Jonestown mass suicide, and the assassination of Martin Luther King). The John Birch Society was an early proponent of an assassination conspiracy theory, with an article by Revilo P. Oliver claiming the KGB did it. Liberty Lobby later took up the assassination conspiracy theory and wooed Mark Lane into defending them in a libel lawsuit brought against them by "Plumber" E. Howard Hunt, in response to an article in Spotlight newspaper claiming Hunt was implicated in the assassination. Louisiana district attorney Jim Garrison prosecuted New Orleans businessman Clay Shaw in 1969 for conspiracy to murder in the Kennedy assassination, claiming that it was the job of a bunch of homosexual males, including Lee Harvey Oswald and Jack Ruby, the motive being it was a "thrill killing"; the jury took 54 minutes to find Shaw not guilty. Shaw even went a step further by disproving the theory himself. Two popular films portraying the Kennedy assassination as a conspiracy were Oliver Stone's 1991 flick JFK, based on Garrison's theory, and the 1973 movie Executive Action, based on Lane's theory that a cabal of right-wing businessmen was behind the assassination. JFK assassination conspiracy books proliferated, in particular, after the popularity of the 1991 film, ranging from the meh to the completely ludicrous. Public reaction to the film caused Congress to enact the JFK Records Act and establishing the Assassination Records Review Board which will release (almost) all records of the investigations by October 2017. Why? It was due to a lack of bowling alleys and nightclubs. No, really. More immediately, he hung out with Castro sympathizers in Mexico City during his unsuccessful attempt to get a Cuban visa, some of whom voiced the opinion that Kennedy should be killed in retaliation for his attempts to have Castro assassinated. According to CIA files released in 2017, Oswald visited the Cuban and Soviet embassies in Mexico City, and on September 28, 1963 he met with "a Soviet consular official named Valery Kostikov, the reputed head of the KGB’s assassinations operations." Oh, and the KGB spread many of the other conspiracy theories, because they knew that given the climate of the time, the Soviet Union was likely to be blamed and they wanted to mitigate that to some extent — it appears to have worked more than they ever imagined. They knew fairly early on that American intelligence didn't believe they were involved, but if the American public was to hold a widespread belief that the Kremlin had Kennedy killed, not only would the door be open for retaliation (some nutjob shooting up Soviet embassies, for example) but it could cause the public to press for war. If declassified Soviet materials are to be believed, they were just as surprised as the Americans by the assassination. The "magic bullet" theory that so often pops up among the conspiracy theories is also based off the seating of the people in the car, Kennedy included. However, if one actually looks at the seating arrangements in the car, then the theory, and any that expand on the idea, are defunct instantly. The theories claim that Governor Connally was sitting in front of Kennedy, and that this proves that Kennedy couldn't have been shot by Oswald. In reality, Kennedy was in the back, and Connally in front of him but slightly to the left and sitting significantly lower than Kennedy on a jumper seat. Connally was in fact always in the path of Oswald's shot. Indeed, the entire thing can be disproved by the way everyone was sitting when Kennedy was shot. Additionally, a closer look at the Zapruder film shows Connally's lapel flip outwards at precisely the moment the first bullet strikes Kennedy. The theory that there were multiple shooters is discredited by the fact that no bullet fragments or shells other than what came from Oswald's Mannlicher-Carcano rifle were discovered anywhere by anyone in Dealey Plaza, the limousine, Parkland Hospital, or in the bodies of Kennedy or Governor Connally. 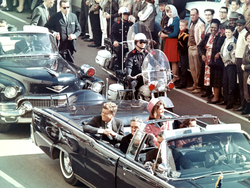 There are still some unanswered questions concerning the event, like the infamous and unidentified Babushka lady who appears to have filmed it, as well as reports that someone, probably mentally ill, made calls in California saying that Kennedy was going to be killed in Dallas that day. The latter is most likely coincidence and could be a fabrication, and the former, even though the footage would offer another, more detailed perspective on Kennedy's death which could be much more valuable than the footage we have, is most likely unimportant to the bigger picture. However, Oswald's death and the failure to prevent it is questionable, as it prevented his trial, obviously, and only fanned the flames of conspiracy. Had Oswald been properly protected, and not left wide open for Jack Ruby, which, admittedly, no one could have seen coming but in hindsight should have been accounted for, maybe a lot of this nonsense could have been put to rest before it spread. Much like Abraham Lincoln, nobody knows what would have been different if Kennedy hadn't been shot. The Umbrella Man, an Errol Morris mini-documentary on one aspect of the assassination. Mortal Error, a book that analyzes the ballistics and concludes that Oswald acted alone, but the shot to Kennedy's head was an accidental shot by a Secret Service agent. JFK Assassination Magic Bullet Computer Recreation - part of a larger documentary (shows how non-magical the magic bullet was). ↑ Sound familiar, video gamers? ↑ When even the pros are tired of it. ↑ See the Wikipedia article on Gerald Ford. ↑ Trump releases some, but not all, JFK assassination records by Jeremy Diamond & Kevin Liptak (Updated 8:04 AM ET, Fri October 27, 2017) CNN. ↑ New batch of JFK assassination files: Oswald in Mexico City and the Watergate burglars by Ian Shapira & Michael E. Miller (November 4 at 10:50 AM) The Washington Post. ↑ K.G.B. Told Tall Tales About Dallas, Book Says, The New York Times (the Mitrokhin Archive, if you were wondering).